Cocked and Loaded, who was coming off back-to-back losses in stakes races in New York and Chicago, is now the points leader on the 2016 “Road to the Kentucky Derby” following a strong return-to-form two-length victory under jockey Emmanuel Esquivel in the 34th running of the $150,000 Iroquois Presented by U.S. Bank (Grade III) for 2-year-olds at 1 1/16 miles on Saturday at Churchill Downs. Cocked and Loaded rallied from seventh to open a clear lead at head of the stretch and maintained that advantage to the finish and paid $21, $10 and $6 as the 9-1 fifth choice in the field of 11 horses. Rated R Superstar could not threaten the winner, but the 11-1 shot rallied for second under Calvin Borel and returned $11.40 and $5.60. Unbridled Outlaw endured major traffic problems under Corey Lanerie, but rallied to finish third and paid 3.40 to show. Conquest Windycity, the 2-1 favorite, finished four lengths behind Cocked and Loaded in fourth. 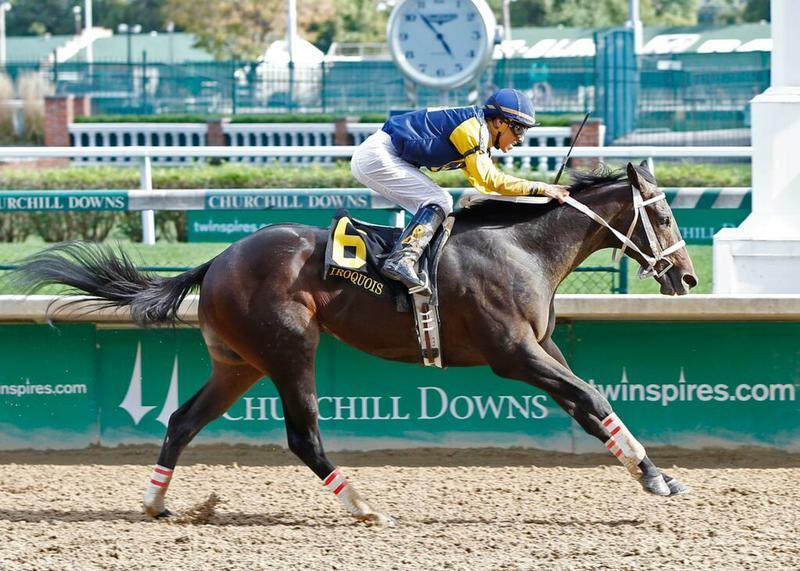 The winner covered 1 1/16 miles over a fast track in 1:44.94 and earned 10 “Road to the Kentucky Derby” points on the system that will determine the field for next year’s 142nd running of the $2 million Kentucky Derby Presented by Yum! Brands on May 7, 2016 at Churchill Downs. 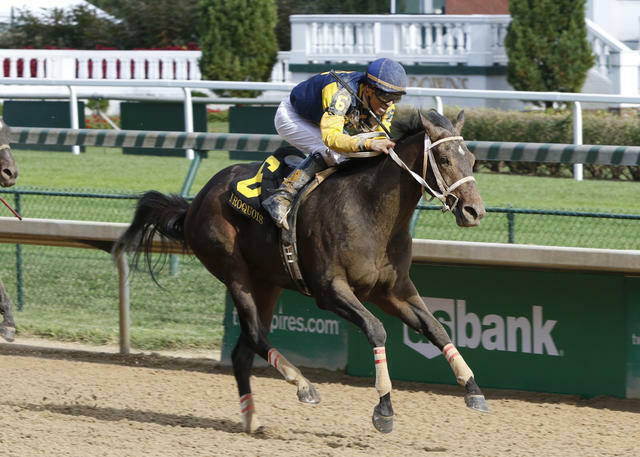 The Iroquois was the first in a series of 35 prep races in the “Road to the Kentucky Derby” system, which is now entering its fourth year. The Iroquois also is part of the Breeders’ Cup “Win and You’re In Juvenile Division” Challenge and the win by Cocked and Loaded earned the Kentucky-bred son of Colonel John a guaranteed spot in the starting gate for the $2 million Sentient Jet Breeders’ Cup Juvenile at Keeneland in Lexington, Ky. on Oct. 31. Cocked and Loaded also earned a travel stipend for the Chicago-based colt’s trip to Keeneland for that race and his entries will be paid by Breeders’ Cup. Owned by Richard Ravin and Patricia’s Hope LLC and trained by Larry Rivelli, Cocked and Loaded won for the third time in five races and lifted his earnings to $250,840. Cocked and Loaded launched his career with impressive victories in an April maiden race at Keeneland and a win in the $250,000 Tremont at Belmont But, but faltered as the favorite in his next two outings: a sixth-place finish in the Grade III Sanford at Saratoga and a fifth-place run in the Grade III Arlington-Washington Futurity over the synthetic Polytrack course at Chicago’s Arlington Park. Condomium broke sharply for the early lead along with Expected Ruler and Missile Bomb, and that group led the Iroquois field through strong early fractions of :22.69 for a quarter-mile and :46.29 for a half-mile. Cocked and Loaded sat patiently behind that trio until Esquivel shifted him four-wide to assume the lead on the far turn and the colt quickly opened a 2 ½-length advantage. Rated R Superstar followed Cocked and Loaded, but could not catch him in the run through the stretch, while Unbridled Outlaw, who encountered major traffic problems entering the far turn and midway through that turn, pulled into the clear and offered a wide late rally. Cocked and Loaded maintained most of his lead in the run to the finish line and won by two lengths, with Rated R Superstar winning the battle for second over the surging Unbridled Outlaw, who surged from eighth in the stretch to finish third, and favored Conquest Windycity, who was fourth after being 10th in the early going, easily held fourth. Completing the order of finish were Baychimo, Star Hill, Meeteetse Fly, Twirling Cinnamon, Missile Bomb, Condominium and Expected Ruler. Dothat Dance was a late scratch. LARRY RIVELLI, trainer of COCKED AND LOADED (winner): “I wanted to run at home, and I always figured he could run long. He’s such a cool horse. He rates and has a good stride. When he ran on the Poly we were scratching out head wondering what was wrong with him was, but he just didn’t like the synthetic surface. He trains well on it; he just can’t run on it. That’s why I trained him on the turf going into this race. “Today he made that move at the three-sixteenth pole and he was just galloping. We’ve always liked this horse a lot and people were down on him because of his last race but he just can’t handle the Polytrack. I’ve always thought the world of him; I think he’s a real special horse. He has a great mind it looks like. He handles everything with stride. “Manny [Esquivel] did a great job. I told him to ride him with confidence and let him do what he needs to do. I’m just really proud of the horse.